Today is National Chocolate with Almonds Day, and this Retro Ad and Recipe from Jell-O and Blue Diamond Almonds for Velvet Almond Fudge Pie is the perfect way to celebrate! "This is an extraordinary pie — incredibly chocolatey, incredibly rich, with the delectable crunch of almonds. What makes this pie so deliciously chocolatey and so extraordinarily rich is the delicious chocolate flavor you bake in with Jell-O brand chocolate fudge flavor pudding and pie filling and chocolate chips. And you bake in the delicious crunch of Blue Diamond almonds, too." Chop almonds and toast at 350 degrees for 5 minutes. Set aside. Blend together until smooth; pie filling mix, corn syrup, milk, egg and chips. 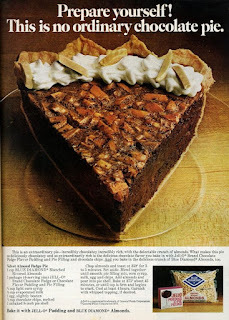 Add almonds and pour into pie shell. Bake at 375 degrees about 45 minutes or until top is firm and begins to crack. Cool at least 4 hours. Garnish with whipped topping, if desired.